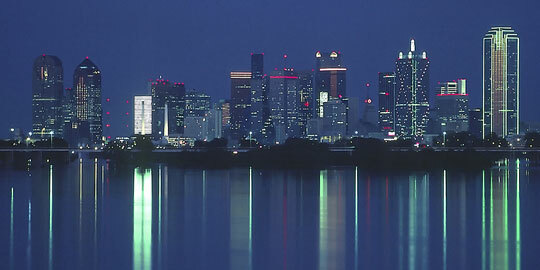 Showcasing a skyline dominated by futuristic skyscrapers, Dallas is the second largest city in Texas and the ninth largest city in the United States. Originally populated by cattle and cowboys, this modern metropolis was founded as a trading post in 1846 and became a prominent center for business and industry after the discovery of oil in 1930. Dallas also gained tragic notoriety as the place of President John F. Kennedy's assassination while traveling by motorcade. It later received more positive acclaim through the extremely popular television show of the same name which ran from 1978 to 1991. The city of Dallas has become one of the the most prominent centers of business and finance in the southwestern United States. In addition to being a leading center for banking, it is second in the nation in insurance company headquarters and convention business, and third nationally in million-dollar Fortune 500 companies. Dallas also has more shopping space and retail centers per capita than any other city in the USA. Visitors will find many impressive options for dining, entertainment, and arts and culture, including a 60-acre arts district located in the downtown area. Other attractions include various museums as well as the Dallas Zoo, Six Flags over Texas, and a 66-acre arboretum and botanical garden. The annual State Fair of Texas held in 277-acre Fair Park is also a huge draw, bringing in over 3 million people each fall. Dallas City Hall - official City of Dallas website. Dallas County Government - official Dallas County website. Dallas Weather and News - current weather in, and recent news about, Dallas. Dallas Product and Service Guide - Dallas enterprises.